We live in a world that isn’t as simple as it was 20 years ago, much less as simple as it was when our grandparents were growing up. I’m a Southern girl, and sometimes I romanticize the days of yesteryear when we all used to drink sweet tea on our front porches. I even vaguely remember shelling peas a few times during the summer while I was a child. Do people even do that anymore? I’ve gotten several emails from people who want to live a simpler life, but it’s hard. I get it. We have financial concerns, it seems kids are “supposed” to be in more extracurricular activities these days, and there’s always a commitment or an obligation, or something preventing us from just relaxing and enjoying life. 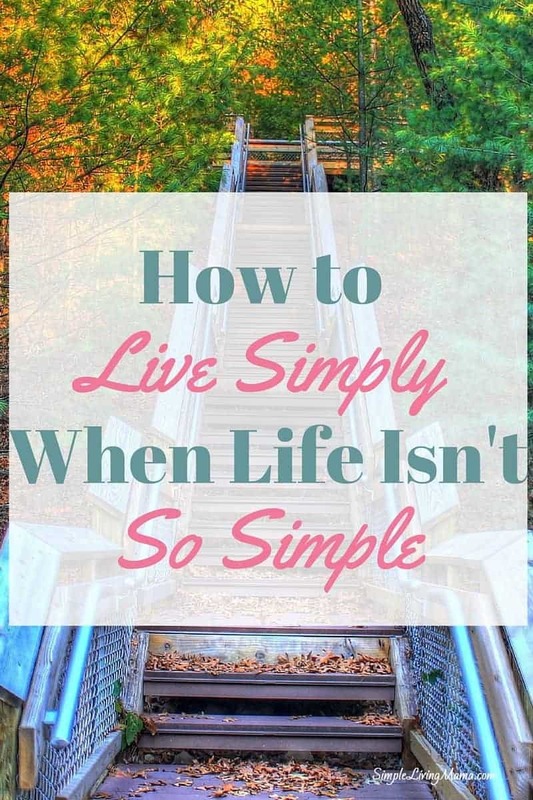 How is it even possible to live simply when life is anything but simple? You need to drown out all the “noise” of the outside world and take a few minutes to just clear your mind. Do people do that anymore? Just be still? You need to do it. I love just laying on my bed and staring up at the ceiling when I really need to think and pray. Think about what you want from life – your priorities. Do you want more time with your family? Do you want more time to read, draw, knit, or whatever hobby it is that you have? Do you want to spend more time cultivating your home and less time running away from it for other obligations? What are your priorities? If you’re like me, your family is likely a very high priority for you under God and your marriage. Your home also ranks up there as a high priority. How can you make your home an inviting place for your family? When Mr. Simple and I decided to downsize, we did it because we wanted all of those things. I purposely chose to be a stay at home mom before we had children and we purposely chose to downsize so I could continue being a stay at home mom and we could live comfortably. We have debt we need to pay off, but we also have children to raise. We may not live in our dream house, but our house is our home and I do what I can to make it that way. If, for example, you want to simplify by making your home life a priority, you may need to let go of one – or several – obligations. Let’s say you want to make family dinners a priority. Well, family dinners will be hard to do if your kids are in several extracurricular activities several nights of the week. Maybe at the end of the season, or the year, or whatever, you decide that each child only does one activity at a time. What about your obligations? If you’re a mom of several young children, now is not the time to volunteer to run the women’s bible study at your church, especially if you are wanting to simplify your life. Did you know that taking care of your home is a ministry? Oh, yes it is. Learn a new skill that will be useful in your life and home. I highly recommend that you learn how to do something that will actually benefit your home. Maybe it’s sewing, maybe it’s knitting, or maybe it’s gardening. My favorite skill that I have learned is cooking. I don’t always cook 100% from scratch, but I have greatly enjoyed planning frugal meals and coming up with my own recipes, as well as cooking some long-time family favorites. The kitchen is the heart of the home and I guarantee anything you learn to do in the kitchen will benefit you and your family. If you follow me on Instagram (my favorite place to hang out online), you will see some of my yummy meal ideas, as well as the fresh garden veggies I’m getting this summer and how I’m using them! Nothing helps you get into a simple mindset like an organized space. It may not be possible to declutter your whole house quickly, but you can always start with mini-decluttering sessions and go from there. Create a place for everything from your children’s books to your incoming mail. In our new home, I work hard to create spaces for everything. I do have five kids, so it is a struggle to get things back to the spaces I’ve created, but they are there. When I can quickly put my home back together, I can breathe a sigh of relief. Our homeschool room is now a part of our living room, so I have purposely added furniture that will accommodate the space without crowding it too much. Bins and baskets are extremely helpful in taming essential “mess” and they make a space look polished, too. It is so easy to get caught up in the world. Our culture likes for us to believe that more is better. It’s all about me. I mean, is it just me or should the generation currently on the cusp of adulthood be called the “selfie” generation? We need to realize life isn’t all about us. I’m a Christian, so I believe in God, I believe that there is a greater purpose for everything. I also know how other people around the world may live. There is happiness in mud huts. There is happiness in small houses. We don’t need all that our society has to offer for happiness, in fact happiness is more likely to be found in less. Appreciate what you do have. Love the people in your life. Do good. Look for the good in others. That’s where you’ll find simplicity. If you found this post helpful, please consider sharing! On the left-hand side of your screen, or down below if you’re on mobile you can choose to share this post on your favorite social media network! Thank you! I relate so much to your opening paragraph! Yearning for the days of old, feeling so bogged down by modern life. When my husband and I first got married, we lived in a 10X10 cabin without electricity in the jungle in Hawaii and grew all our own produce and ate local breadfruit and avocados. We had so little possessions, amenities OR responsibilities and it was lovely! I miss those days. However I learned so much from that experience about keeping life simple. We’ve built our household from the ground up, basically, So we never did gain a whole lot of stuff and have kept some of the habits we gained in that day. I love these suggestions and they’re totally on point, especially learning a new skill! There are many great ways to live simpler and more old-fashioned in a modern life by learning how to make things, preserve things, DIY and getting back to nature. Thanks for a lovely article!